Reading and share top 29 famous quotes and sayings about Love Endures by famous authors and people. Browse top 29 famous quotes and sayings about Love Endures by most favorite authors. 1. "The fact of that devotion is nothing less than sacrifice. The only good of which mortals are capable of love. To even begin to do good, one must be willing to go beyond oneself. All things made by man perish. All words scatter into the emptiness that is the future. Only love endures. Love for what is. Not for what was or could be. Love for what is—that alone is true love. That alone the future cannot dissolve. For that love is God." 2. "Before the beginning of yearsThere came to the making of manTime, with a gift of tears;Grief, with a glass that ran;Pleasure, with pain for leaven;Summer, with flowers that fell;Remembrance, fallen from heaven,And madness risen from hell;Strength without hands to smite;Love that endures for a breath;Night, the shadow of light,And Life, the shadow of death." 3. "The hollowness in his chest, the tense yearning, the loneliness he braces against, every morning until he can immerse himself in work and forget. Not love. Something else, something with a power that endures. Not love, but a memory of love." 4. "Love bears all things, believes all things, hopes all things, endures all things. Love never ends. (I Corinthians 13: 7-8a ESV)"
5. "The Lord will fulfill his purpose for me; your love, O Lord, endures forever - do not abandon the works of your hands." 6. "A distant love that waits to be together, is by far the most difficult relationship. It's like lighting a candle, and adoring the long flame and robust glow. Until time sets in like wax, overflowing deeper and deeper into the wick, leaving a sparse flame struggling to live. 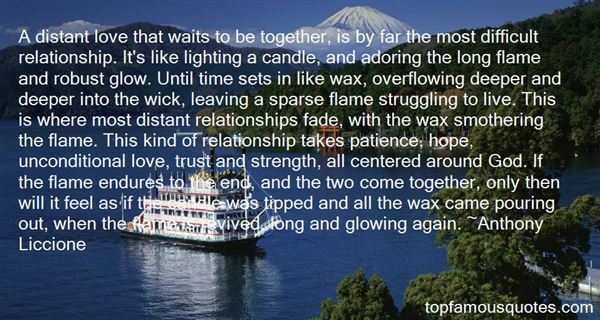 This is where most distant relationships fade, with the wax smothering the flame. This kind of relationship takes patience, hope, unconditional love, trust and strength, all centered around God. If the flame endures to the end, and the two come together, only then will it feel as if the candle was tipped and all the wax came pouring out, when the flame is revived, long and glowing again." 7. "If you keep silent, keep silent by love: if you speak, speak by love; if you correct, correct by love; if you pardon, pardon by love; let love be rooted in you, and from the root nothing but good can grow.Love and do what you will.Love endures in adversity, is moderate in prosperity; brave under harsh sufferings, cheerful in good works; utterly reliable in temptation, utterly open-handed in hospitality; as happy as can be among true brothers and sisters, as patient as you can get among the false one's. The soul of the scriptures, the force of prophecy, the saving power of the sacraments, the fruit of faith, the wealth of the poor, the life of the dying.Love is all." 8. "As he clutched her in his shaking hands and wept against her, he whispered into her ear, the words that made him believe. "Love bears all things. Endures all things," he said. "Ours has, hasn't it?" She nodded and held him tighter. "But can it endure this, Anais? This demon who holds me so mercilessly in its claws? "She touched his face and kissed him. "My love can and will, Lindsay. I will be here when you open your eyes. I will give you whatever you need to make it more bearable." 9. "To survive as a human being is possible only through love. And, when Thanatos is ascendant, the instinct must be to reach out to those we love, to see in them all the divinity, pity, and pathos of the human. And to recognize love in the lives of others - even those with whom we are in conflict - love that is like our own. It does not mean we will avoid war or death. It does not mean that we as distinct individuals will survive. But love, in its mystery, has its own power. It alone gives us meaning that endures. I alone allows us to embrace and cherish life. 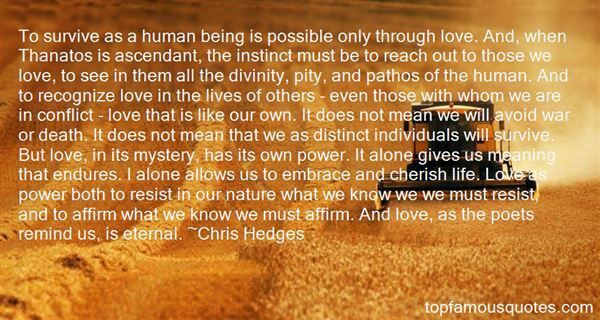 Love as power both to resist in our nature what we know we we must resist, and to affirm what we know we must affirm. And love, as the poets remind us, is eternal." 10. "True love bears all, endures all and triumphs!" 11. "How short a time the fire of love endures in womanif frequent sight and touch do not rekindle it." 12. "Emotions have cycles whereas love endures. Some people confuse emotions, which are ever-changing, with love's durability." 13. "A woman can tolerate delays knowing they are not denials; she is diligent, and composed. She is not easily irritated like love; she endures all things, beans all things and can be stretched to any limit." 14. "Love ENDURES and works out ways of enduring the other stuff. As long as you can communicate you can work out issues, but good communication seems to be one of the weakest skills in human beings, so don't be afraid to try and try different ways of communicating, be patient. Don't be afraid of seeking help either - the chance to keep love alive is too important to let fear get in the way." 15. "To you who think you are lost or without hope, or who think you have done too much that was too wrong for too long, to every one of you who worry that you are stranded somewhere on the wintry plains of life and have wrecked your handcart in the process, we call out "Jehovah's unrelenting refrain, "My hand is stretched out still" (Isaiah 5:25: 9:17,21). "...His mercy endureth forever, and His hand is stretched out still. His is the pure love of Christ, the charity that never faileth, that compassion which endures even when all other strength disappears"." 16. "You can have everything in the world, but if you don't have love, none of it means crap," he said promptly. "Love is patient. Love is kind. Love always forgives, trusts, supports, and endures. Love never fails. When every star in the heavens grows cold, and when silence lies once more on the face of the deep, three things will endure: faith, hope, and love." And the greatest of these is love," I finished. "That's from the Bible." First Corinthians, chapter thirteen," Thomas confirmed. "I paraphrased. Father makes all of us memorize that passage. Like when parents put those green yucky-face stickers on the poisonous cleaning products under the kitchen sink." 17. "Death's wisdom is finding, at the end, that you think only of those you loved, and why you didn't love them more. Love is the only true force that endures." 18. "Love is not temporary. It endures everything even if it changes form. Even when it must be put away to handle harsher things, it's always there, ready to be called." 19. "If a woman is given only a limited amount of time to spend with the man she loves, she endures the separation by constantly recalling and reliving every moment down to the finest detail." 20. "What is this love that endures decades, passes on sleep, and resists death to give one kiss? Call it agape love, a love that bears a semblance of God's." 21. "But true love goes far deeper than that. It is an unexplainable connection of the heart, one that endures triumph and tragedy, pain and suffering, obstacles and loss. It is something that is either present or missing - there is no "almost", "in between", "most of the time." It is the unexplainable reason that some marriages entered into after one-week courtships can last a lifetime. Its absence is why "perfect" marriages fall apart. It can't be quantified or explained in science, religion, or philosophy. It can't be advised on by friends or marriage counselors who can't take their own advice. There are no rules, no how-to books, no guaranteed methods of success. It is not defined by vows or rings or promises of tomorrow. It is simply a miracle of God, that too few are blessed to experience." 22. "Great love endures time, heartache, and distance. And even when all seems lost, true love lives on." 23. "A king does not abide within his tent while his men bleed and die upon the field. A king does not dine while his men go hungry, nor sleep when they stand at watch upon the wall. A king does not command his men's loyalty through fear nor purchase it with gold; he earns their love by the sweat of his own back and the pains he endures for their sake. That which comprises the harshest burden, a king lifts first and sets down last. A king does not require service of those he leads but provides it to them...A king does not expend his substance to enslave men, but by his conduct and example makes them free." 24. "The sweetness of love is short-lived, but the pain endures." 25. "All things belonging to the earth will never change-the leaf, the blade, the flower, the wind that cries and sleeps and wakes again, the trees whose stiff arms clash and tremble in the dark, and the dust of lovers long since buried in the earth-all things proceeding from the earth to seasons, all things that lapse and change and come again upon the earth-these things will always be the same, for they come up from the earth that never changes, they go back into the earth that lasts forever. Only the earth endures, but it endures forever." 26. "Love isn't about living in fear. It's not about controlling the hearts of those around you. It is patient and kind. It endures and believes the very best. It never gives up." 27. "A father may turn his back on his child, brothers and sisters may become inveterate enemies, husbands may desert their wives, wives their husbands. But a mother's love endures through all." 28. "I take literally the statement in the Gospel of John that God loves the world. I believe that the world was created and approved by love, that it subsists, coheres, and endures by love, and that, insofar as it is redeemable, it can be redeemed only by love. I believe that divine love, incarnate and indwelling in the world, summons the world always toward wholeness, which ultimately is reconciliation and atonement with God." 29. "Why risk the rare happy marriage-rarer still, a love marriage that endures-for something as common and toxic as complete, unthinking, transparent honesty? Who would be helped by my telling? Me? not at all. I was made of steel, I promise you." Lulled in the countless chambers of the brain, our thoughts are linked by many a hidden chain; awake but one, and in, what myriads rise!"